Reading prompt: What are the most important things designers need to consider when thinking about mobile users/desktop users/accessibility? How does this relate to your class project? Post to class WP site (category: reading) before 5 pm on Wednesday. Read and comment (asking questions is good!) on the post of the person who follows you in the alphabet (Nicole, you’ll respond to Andrew’s post ). 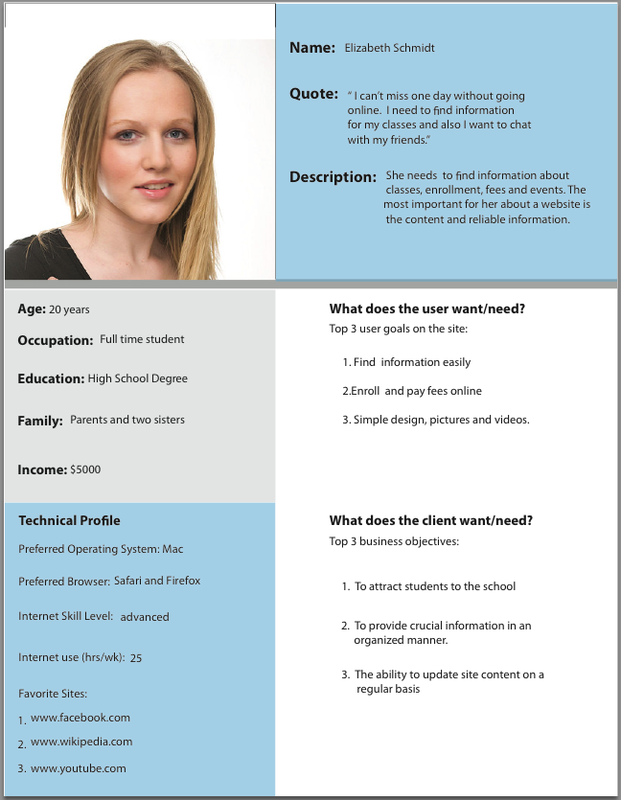 Research post: for your project, develop three personas with specific scenarios/tasks. Use your work with your competitor sites to help develop tasks. Tell me what platform/device you are designing for and why. Post to class WP site (category: research) before 5 pm on Wednesday. Prep for quiz (session 6): develop three-four questions related to the reading or lectures, focusing on concepts/principles that you think are important take-aways from the course. Explain why. Post to class WP site (category: journal) before 5 pm on Wednesday. Housekeeping 1: I need to know how to get in touch with you quickly and y’all aren’t answering email — do you want me to text you? Research review (above) – personas. Talk in small groups. Rework in class. Repost (new post) with category “in-class”. What are your persona’s goals; what are they trying to achieve? What do your personas actually do to achieve their goals? What experiences (personal, social, and cultural) do they bring to the tasks? How are your personas influenced by their physical environment? Think back to the toothbrush exercise! if “buy a new pair of black dressy flats” is a goal // what are the tasks/sub-tasks, what do I have to “do” in order to meet my goal? Your re-worked post must have three fleshed out tasks for each persona. All three personas cannot have the same task sub-set. Interaction re-do (model: example from prior class): Andrew // Jackson // KatieC // KatieJ (read this for example of how to incorporate class concepts in a reflection) // Nicole (absent) — Kathy provides comments. In-class/journal: continue reworking your personas. Reading prompt: Thinking about your projects, how do these readings help you with your visual design? Interaction design? Post to class WP site before 5 pm on Friday (category: reading). Research post: test your competitor sites with one of your personas, all of your tasks. Post to class WP site before 5 pm on Friday (category: research). Research post: post the low-fidelity wireframes for your project. Post to class WP site before 5 pm on Friday (category: research). Watch this video — prepare a response (minimum 500 words) that links video content to your project (and convinces me that you watched it in toto). Post to class WP site before 11:59 pm on Friday (category: in-class). Watch this video — use the concepts here to help you refine your wireframes for Monday. Prepare a response (minimum 300 words) that explains how you are evolving your wireframe design Post to class WP site before 11:59 pm on Friday (category: research). Review this Slideshare presentation — what concepts/tips resonate with you as a one-person UX team this session? Post to class WP site before 11:59 pm on Friday (category: journal). Reading prompt: Thinking about your projects, how do these readings help you with your visual design? Interaction design? Post to class WP site before 5 pm on Monday (category: reading). Research post: post the high-fidelity wireframes for your project. Post to class WP site before 5 pm on Monday.